Kokeshi are handmade wooden dolls, originally from the northeast area in Japan. The dolls are simple cylindrical shape with big round head. They don’t have arms and legs. 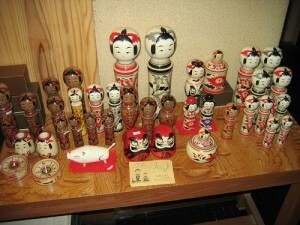 Traditional kokeshi dolls look like bowling pins but there are small round kokeshi dolls too. In early 19th century, kokeshi were sold as souvenirs around hot springs area in [W:Tōhoku] (northeast). People collect kokeshi made by different artists and enjoy decorating them. Even though kokeshi are simple, the antique ones are sometimes priced almost 1,000,000 yen! Don’t worry, regular price of a traditional souvenir kokeshi is 2,000 to 3,000 yen. Ice Biz -Turn off Air and Eat Ice Cream!